The perfect salad for a weekend lunch with friends that they are sure to enjoy. 1. Preheat the oven to 190°C, gas mark 5. Put the onion and peach wedges in a large roasting tin (about 33 x 22cm). 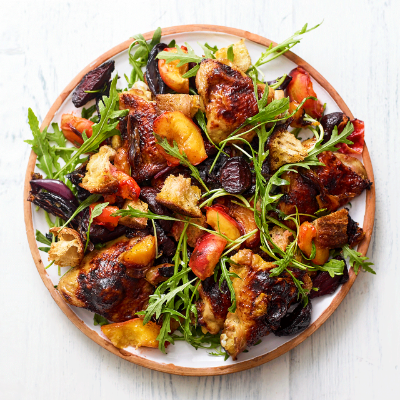 Put the chicken pieces on top, season and brush with 1½ tbsp balsamic glaze. 2. In another, small roasting tin, toss together the beetroot, 1 tbsp oil, and remaining ½ tbsp balsamic glaze. Put both tins in the oven; cook for 30 minutes. Remove from the oven and increase the temperature to 200˚C, gas mark 6. 3. Nestle the torn bread into the trays and drizzle with the remaining 1 tbsp oil, then return to the oven for 20 minutes. When golden, tip everything into a large salad bowl, toss through the rocket leaves and serve.